Musician, Performer, Songwriter, Arranger, Music Producer, Music Supervisor, TV Producer, Actor, Director, Broadway Producer, TV and Film Composer, and Live Event Producer, International DJ, Activist, Historian, Teacher, member of the Rock and Roll Hall of Fame, and recognized internationally as one of the world’s foremost authorities on both Contemporary and Traditional Rock and Roll. Aug 08 2017 Little Steven and Disciples of Soul "Soulfire Tour 2017"
Citi® is the official pre-sale credit card of the “Soulfire Tour 2017”. As such, Citi® cardmembers will have access to purchase pre-sale tickets beginning Tuesday, August 8th at 10AM local time until Friday, August 11th at 10PM local time through Citi’s Private Pass® program. For complete pre-sale details visitwww.citiprivatepass.com. For complete details and ticket availability, please visit littlesteven.com. The “Soulfire Tour 2017” celebrates the recent release of Little Steven’s sensational new solo album, SOULFIRE, available now via Wicked Cool/Big Machine/UMe. The album is available as CD, digital download, and 180-gram black vinyl, the latter presented as a double LP housed in a gatefold sleeve with the music on Sides 1-3 and a unique etching of Little Steven on Side 4. SOULFIRE was arranged and produced by Van Zandt at his own Renegade Studios in New York City. He is of course known around the world for his utterly personal songwriting and an ambitious adventurousness that has fueled much of his creative output these past two decades. In addition to his ongoing role as a touring and recording member of The E Street Band, Van Zandt has also expanded his artistic parameters to include landmark work as an actor on The Sopranos and Lilyhammer as well as host, historian, and rock ‘n’ roll advocate on Sirius XM’s one-and-only “Little Steven’s Underground Garage” (not to mention creator of Sirius XM’s long-running “Outlaw Country” format). Van Zandt has also expanding his musical boundaries to include composing the score for all three seasons of Lilyhammer and additional work as producer and songwriter, lending his distinctive craft to records from an array of international garage rockers. Little Steven and The Disciples of Soul made their long awaited live return last October at London’s BluesFest 2016. Van Zandt will return to Europe this fall for an additional leg of the “Soulfire Tour 2017,” with multiple stops slated for England, Scotland, Germany, The Netherlands, and Spain. 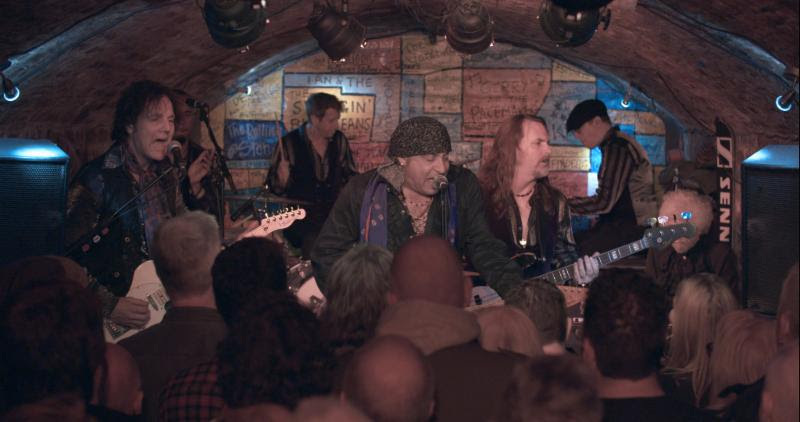 Stevie Van Zandt, a founding member of Bruce Springsteen’s E Street Band, surprised Liverpool fans with an intimate lunchtime set at Liverpool’s most iconic venue, Cavern Club, during his seven-date UK tour. Van Zandt wanted to pay homage to The Beatles by playing a lunchtime show in this legendary club. The Beatles played approximately 150 lunchtime shows there between 1961- 1963. The set was the perfect warm up for Stevie’s penultimate UK show at O2 Academy Liverpool tonight. Van Zandt paid tribute to Liverpool’s most treasured band during his set, playing a mix of Beatles originals and their favorite tracks from the Cavern years, including “Some Other Guy” (by Richard Barrett), “Boys” (originally by the Shirelles), “Slow Down” (by Larry Williams) and “Soldier Of Love” (first recorded by Arthur Alexander). Van Zandt – also known as Little Steven – and his band, The Disciples Of Soul, are currently on their first UK tour in 25 years, celebrating the release of Soulfire, his first album in 15 years. The tour kicked off at London’s Roundhouse on November 4, with a surprise appearance from one of the Cavern Club’s previous resident performers, The Beatles’ Sir Paul McCartney. During the tour, Van Zandt also visited Bristol, Leeds, Birmingham and Glasgow. His final UK show will take place at Newcastle’s O2 Academy on November 16. Next, Van Zandt will be playing across Europe until the end of 2017. About Steven Van Zandt: Steven Van Zandt is a Musician, Performer, Songwriter, Arranger, Music Producer, Music Supervisor, TV Producer, Actor, Director, Broadway Producer, TV and Film Composer, Live Event Producer, International DJ, Activist, Historian, Teacher, member of the Rock and Roll Hall of Fame, and is recognized internationally as one of the world’s foremost authorities on both Contemporary and Traditional Rock and Roll. About Soulfire: Soulfire is Stevie Van Zandt’s first solo album in almost 20 years, named by Rolling Stone as one of the best records of 2017. It is without question his purest and most uniquely personal artistic statement thus far. The album sees the Rock & Roll Hall of Famer revisiting songs that span the length of his career as artist, performer, producer, arranger, and songwriter. He focuses directly on the hugely influential “soul horns-meet-rock ‘n’ roll guitars” approach he first pioneered on Southside Johnny and the Asbury Jukes’ classic first three albums. ADDITIONAL DATES TO BE ANNOUNCED The Rock and Roll Forever Foundation is a 501(c)(3) established by Steven Van Zandt. TeachRock is the Foundation’s national middle and high school curriculum initiative. Created to address the challenges of an environment in which schools face cuts to arts funding, TeachRock brings rich, multimedia educational materials to teachers and students everywhere at no cost. TeachRock’s groundbreaking lesson plan collections and resources help teachers engage students by connecting the history of popular music to classroom work across the disciplines. From social studies and language arts to geography, media studies, science, general music, and more, TeachRock offers engaging and meaningful arts integration material for every classroom. TeachRock is endorsed by the New Jersey School Boards Association, the National Council for the Social Studies, the National Association for Music Education and the National Council for Geographic Education, with partners including Scholastic Inc., HBO, PBS, Reelin’ in the Years, ABC News, Rock’s Backpages, New York University’s Steinhardt School, and the Grammy Museum. For lesson plans and additional information, please visit teachrock.org. Little Steven and The Disciples of Soul made their long-awaited live return at London’s BluesFest in 2016. 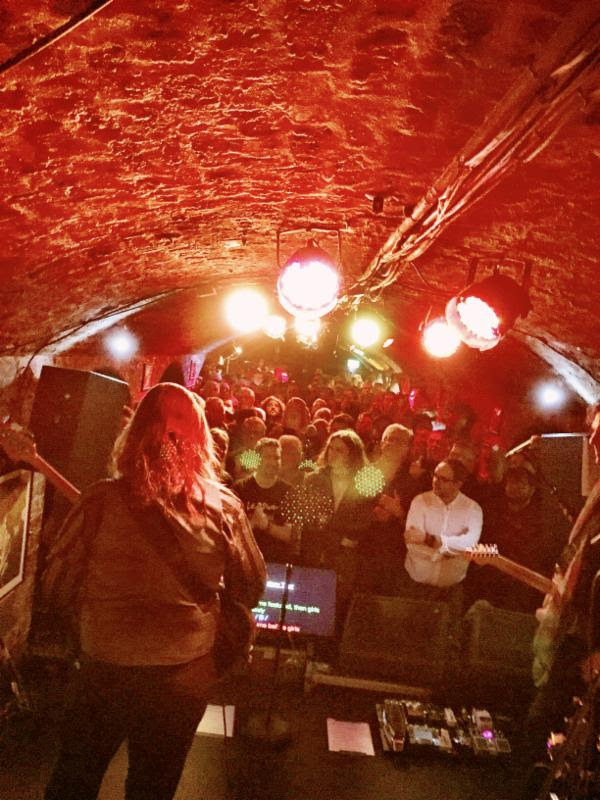 Since then, the band has traversed the globe, with multiple dates in America, England, Scotland, Germany, The Netherlands and Spain, highlighted not only by Paul McCartney sitting in to perform “I Saw Her Standing There” in London, but also by a lunchtime show performance at Liverpool’s Cavern Club. The Soulfire Tour marked the acclaimed release of Little Steven’s sensational new solo album, SOULFIRE, available now via Wicked Cool/Big Machine/UMe. The album is available as CD, digital download, and 180-gram black vinyl, the latter presented as a double LP housed in a gatefold sleeve with the music on Sides 1-3 and a unique etching of Little Steven on Side 4. SOULFIRE is Stevie Van Zandt’s first solo album in close to two decades and without question his purest and most uniquely personal artistic statement thus far. The album sees the Rock & Roll Hall of Famer revisiting songs that span the length of his career as artist, performer, producer, arranger, and songwriter, focusing directly on the hugely influential “soul horns-meet-rock ‘n’ roll guitars” approach he first pioneered on Southside Johnny and the Asbury Jukes’ classic first three albums. SOULFIRE quickly drew rapturous applause from fans and critics alike, with Rolling Stone declaring, “Rock’s ultimate sideman reclaims the Jersey Shore sound he helped invent.” “Cynicism, irony and cultivated hip detachment have taken their toll on rock ‘n’ roll,” raved USA Today. “With SOULFIRE, Van Zandt aims to blow all that out and lead listeners back to its more passionate essence.” “It’s hard to imagine a more joyous and revelatory contemporary blue-eyed soul recording,” enthused American Songwriter. “The appropriately titled SOULFIRE is a tough, tight and clearly inspired project as well as a most welcome return from the musical shadows for Steven Van Zandt.” SOULFIRE “hearkens back to Van Zandt’s classic first solo album of gritty, greasy, horn-accented ’60s-style rock and soul,” noted Billboard, while Paste proclaimed, “Rockier than Motown or the Sound of Philadelphia, this a joyous invitation to live and love.” Little Steven Van Zandt is of course known around the world for his utterly personal songwriting and an ambitious adventurousness that has fueled much of his creative output these past two decades. In addition to his ongoing role as a touring and recording member of The E Street Band, he has also expanded his artistic parameters to include landmark work as an actor on The Sopranos and Lilyhammer as well as host, historian, and rock ‘n’ roll advocate on Sirius XM’s one-and-only “Little Steven’s Underground Garage” (not to mention creator of Sirius XM’s long-running “Outlaw Country” format). Van Zandt has also expanding his musical boundaries to include composing the score for all three seasons of Lilyhammer and additional work as producer and songwriter, lending his distinctive craft to records from an array of international garage rockers. WITH SURPRISE RELEASE OF SOULFIRE LIVE! (New York, NY) Little Steven and the Disciples of Soul are heralding this Sunday’s start of a landmark live tour with today’s surprise release of SOULFIRE LIVE!, a 24-track collection recorded last year in North America and Europe during the legendary rock ‘n’ roller’s first tour in nearly two decades, SOULFIRE LIVE! is available now at all digital music retailers and streaming services; physical 3-CD, Blu-ray, and vinyl editions will arrive this summer. Megyn Kelly TODAY at 9am ET. SOULFIRE LIVE! is an epic and electrifying journey through rock ‘n’ roll history led by one of its most passionate practitioners, showcasing Stevie Van Zandt’s limitless knowledge, talent, and sheer love for the genre in all its many shapes and guises. Among the album’s many highlights is the introduction made by the legendary Mike Stoller, who along with partner Jerry Leiber, are widely considered to be the first successful and the most enduring rock songwriters and producers of all time. Other highlights on the album are the original songs from throughout Little Steven’s illustrious career – including classics like “Standing In The Line Of Fire” and “I Don’t Want To Go Home” – alongside a number of favorite cover versions like The Electric Flag’s “Groovin’ Is Easy,” Etta James’ “Blues Is My Business,” and James Brown’s “Down And Out In New York City,” the latter two songs also featured on last year’s critically acclaimed SOULFIRE. In addition, SOULFIRE LIVE! includes Van Zandt’s inimitable introductions, detailing each song’s unique history and singular spot in his life and illustrious career. SOULFIRE LIVE! arrives just as Little Steven and the Disciples of Soul prepare to embark on a major live tour benefitting TeachRock, the Rock and Roll Forever Foundation’s national initiative to bring music curriculum into middle and high schools across the country. At each stop of the tour, TeachRock will host workshops before the show to educate teachers on how to implement music education into their curriculum. For more information, please reach out to Christine@RockAndRollForever.org. The dates – which mark the first-ever tour rock tour specifically geared to address to this crucial societal need – begin this Sunday, April 29 at New Brunswick, NJ’s historic State Theatre and then continue in May. Limited VIP packages – including merch bundles, meet-and-greets, and sound check entry – are also available. For complete details and ticket availability, please visit littlesteven.com. Little Steven and the Disciples of Soul will also spend much of the summer traversing Europe, including headline shows and eagerly awaited festival performances in the United Kingdom, Germany, the Netherlands, Spain, Belgium, Ireland, and Norway. 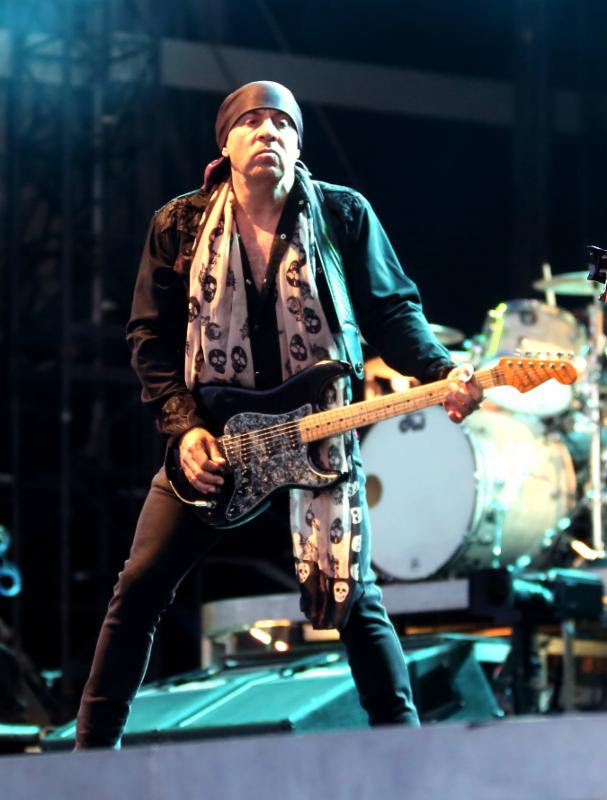 Little Steven Van Zandt is of course known around the world for his utterly personal songwriting and an ambitious adventurousness that has fueled much of his creative output these past four decades. In addition to his ongoing role as a touring and recording member of The E Street Band, he has also expanded his artistic parameters to include landmark work as an actor on The Sopranos and Lilyhammer as well as host, historian, and rock ‘n’ roll advocate on Sirius XM’s one-and-only “Little Steven’s Underground Garage” (not to mention creator of Sirius XM’s long-running “Outlaw Country” format). Van Zandt has also expanding his musical boundaries to include composing the score for all three seasons of Lilyhammer and additional work as producer and songwriter, lending his distinctive craft to records from an array of international garage rockers. The Rock and Roll Forever Foundation is a 501(c)(3) established by Steven Van Zandt. TeachRock is the Foundation’s national middle and high school curriculum initiative. Created to address the challenges of an environment in which schools face cuts to arts funding, TeachRock brings rich, multimedia educational materials to teachers and students everywhere at no cost. TeachRock’s groundbreaking lesson plan collections and resources help teachers engage students by connecting the history of popular music to classroom work across the disciplines. From social studies and language arts to geography, media studies, science, general music, and more, TeachRock offers engaging and meaningful arts integration material for every classroom. TeachRock is endorsed by the National Council for the Social Studies, the National Association for Music Education, and the National Council for Geographic Education, with partners including Scholastic Inc., PBS, Reelin’ in the Years, ABC News, Rock’s Backpages, New York University’s Steinhardt School, and the Grammy Museum. For lesson plans and additional information, please visit teachrock.org. LIFT THE CURTAIN ON SOULFIRE LIVE! FINAL LEG OF TEACHER APPRECIATION TOUR SET TO GET UNDERWAY IN OCTOBER – TEACHERS GET IN FREE! Rolling Stone is premiering the live video of Little Steven’s performance of “Can I Get A Witness,” featuring Richie Sambora. Recorded last year at the famed Orpheum Theatre in Los Angeles, the video captures Little Steven and his 15-piece band, the Disciple of Soul’s, spirited and sweat-soaked shows which will be on full display on the Blu-Ray coming later this year. Fans can now pre-order ahead of their release later this year, SOULFIRE LIVE! as a unique 7LP vinyl box set and on Blu-Ray video exclusively at Little Steven’s just-launched new webstore. The vinyl box set will incorporate an exclusive bonus LP capturing Little Steven’s extraordinary surprise set at Liverpool’s legendary Cavern Club recorded November 2017 during his band’s sold out European tour. The intimate lunchtime gig saw Little Steven and the Disciples of Soul paying tribute to The Beatles with rocking renditions of “Magical Mystery Tour,” “Good Morning, Good Morning,” “Got To Get You Into My Life,” and “All You Need Is Love,” alongside iconic songs famously performed by the nascent Fab Four, including “Boys” (originally by The Shirelles), “Slow Down” (by Larry Williams) and “Soldier Of Love” (first recorded by Arthur Alexander). SOULFIRE LIVE! is an epic and electrifying journey through rock ‘n’ roll history led by one of its most passionate practitioners, showcasing Stevie Van Zandt’s limitless knowledge, talent, and sheer love for the genre in all its many shapes and guises. Among the album’s many highlights are original songs from throughout Little Steven’s illustrious career – including classics like “Standing In The Line Of Fire” and “I Don’t Want To Go Home” – alongside a number of favorite cover versions like The Electric Flag’s “Groovin’ Is Easy,” Etta James’ “Blues Is My Business,” and James Brown’s “Down And Out In New York City,” the latter two songs also featured on last year’s critically acclaimed SOULFIRE. In addition, SOULFIRE LIVE! includes Van Zandt’s inimitable introductions, detailing each song’s unique history and singular spot in his life and illustrious career. The exclusive SOULFIRE LIVE! third disc showcases special guest appearances from some of Little Steven’s closest friends, collaborators, and favorite artists. Among the highlights are versions of Moby Grape’s “Can’t Be So Bad” performed with the legendary San Francisco band’s founding member, Jerry Miller; the Motown classic, “Can I Get A Witness,” performed with New Jersey’s own Richie Sambora; The J. Geils Band’s “Freeze Frame” with vocals from the one and only Peter Wolf; and “Tenth Avenue Freeze-Out” and Little Steven’s own “I Don’t Want To Go Home,” both joined by Bruce Springsteen. SOULFIRE LIVE! 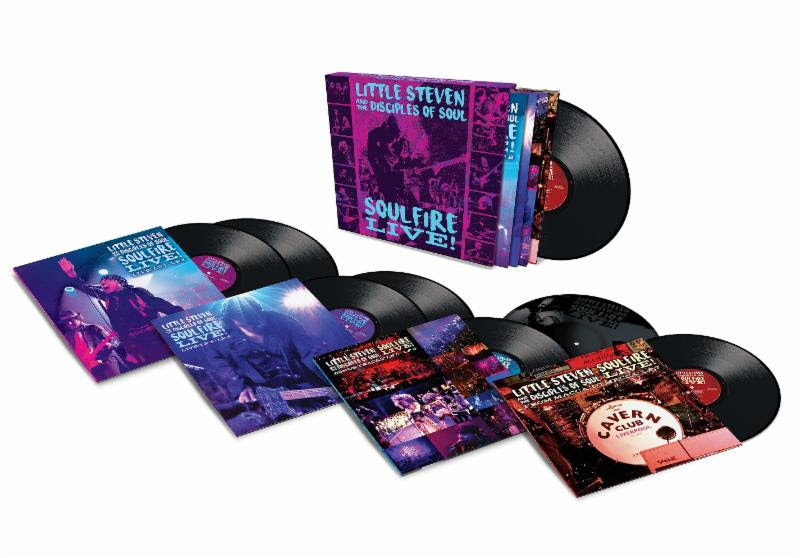 follows last year’s acclaimed release of Little Steven’s sensational SOULFIRE, available now via Wicked Cool/Big Machine/UMe. The album is available as CD, digital download, and 180-gram black vinyl, the latter presented as a double LP housed in a gatefold sleeve with the music on Sides 1-3 and a unique etching of Little Steven on Side 4. Stevie Van Zandt’s first solo album in close to two decades, SOULFIRE is without question his purest and most uniquely personal artistic statement thus far. The album sees the Rock & Roll Hall of Famer revisiting songs that span the length of his career as artist, performer, producer, arranger, and songwriter, focusing directly on the hugely influential “soul horns-meet-rock ‘n’ roll guitars” approach he first pioneered on Southside Johnny and the Asbury Jukes’ classic first three albums. SOULFIRE was arranged and produced by Van Zandt at his own Renegade Studios in New York City, co-produced and recorded by GRAMMY® Award-winner Geoff Sanoff (Fountains of Wayne, Stephen Colbert) and co-produced and music directed by guitarist Marc Ribler. The album was mixed and mastered by Van Zandt’s career-long collaborators and friends Bob Clearmountain (Rolling Stones, David Bowie, The Who, Bryan Adams), and Bob Ludwig (Led Zeppelin, Nirvana, The Band, Sly and the Family Stone). 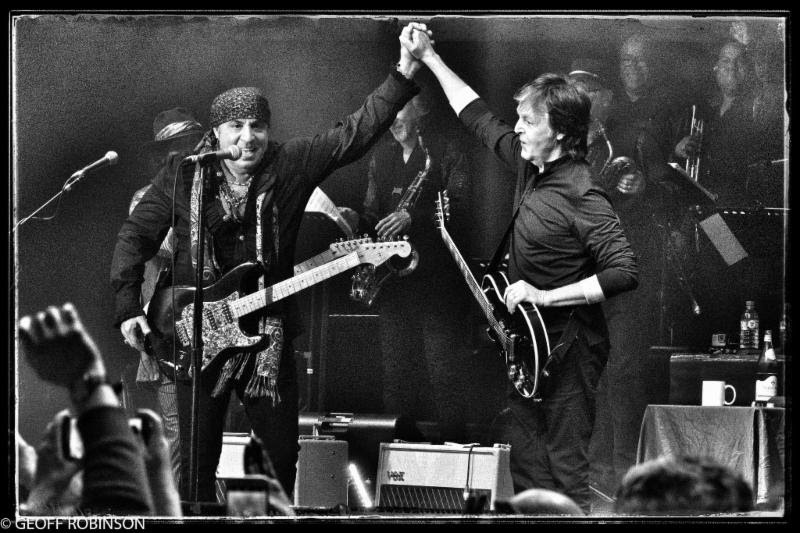 Sep 17 2018 Steven Van Zandt's "Soulfire Teacher Solidarity Tour 2018"
Little Steven and the Disciples of Soul will show solidarity with and say thank you to hard-working teachers across North America with a landmark headline tour introducing TeachRock, the Rock and Roll Forever Foundation’s free, multimedia, K-12 interdisciplinary curriculum which meets prevailing standards in English Language Arts, Social Studies/History, the Fine and Performing Arts, and also includes STEAM and advisory material. The “Soulfire Teacher Solidarity Tour 2018” begins October 18 at The Kirby Center in Wilkes Barre, PA and then continues into December. All shows on sale now. For complete details and tickets, please visit www.littlesteven.com/on-tour. The Little Steven and the Disciples of Soul Teacher Appreciation Tour Professional Development Experience will offer an introduction to the Teachrock.org curriculum, and include material suitable for K-12 teachers of all disciplines, interdisciplinary best practices, and group activities. In addition, the one-hour workshops will see a personal visit from Little Steven, with attendees also receiving a teacher-only edition “Teacher Appreciation Tour” t-shirt, a certificate of attendance, and tickets for the educator and a guest to that evening’s Little Steven and the Disciples of Soul concert. Little Steven unveiled the “Soulfire Teacher Solidarity Tour 2018” earlier this week with a personal video announcement, streaming now at the official TeachRock YouTube channel HERE. Steven Van Zandt’s Rock and Roll Forever Foundation is a 501(c)(3) organization that integrates arts throughout K-12 classrooms via rich, standard-aligned lesson plans and hands-on teacher workshops, all delivered to educators and districts at no cost. TeachRock is a standards-aligned arts integration curriculum that uses the history and culture of popular music to engage students in all disciplines. From social studies and language arts to geography, STEAM, general music, and more: TeachRock has engaging and meaningful material for every K-12 classroom, and it’s all shared with teachers and students at no cost. TeachRock is endorsed by the National Council for the Social Studies, the National Association for Music Education, and the National Council for Geographic Education, with partners including Scholastic Inc., PBS, Reelin’ in the Years, ABC News, Rock’s Backpages, New York University’s Steinhardt School, and the Grammy Museum. Forlesson plans and additional information, please visit teachrock.org. The Soulfire TeachRock Tour 2018 follows the recent release of SOULFIRE LIVE!, a spectacular new live collection recorded last year in North America and Europe during Little Steven’s first world tour in nearly two decades. The 3CD and LP editions feature an exclusive third disc highlighted by superstar guest performances recorded throughout the trek, including Bruce Springsteen, Richie Sambora, Peter Wolf, and Jerry Miller (of Moby Grape). SOULFIRE LIVE! is available now via Wicked Cool/Big Machine/UMe. A unique 7LP vinyl box set and Blu-ray edition of SOULFIRE LIVE! is also on the way and is available to pre-order now. The final leg of Little Steven and the Disciples of Soul’s Teacher Solidarity Tour has reached the incredible goal of registering over 10,000 teachers to use the TeachRock Music History Curriculum. The tour, which began last week in association with the Rock and Roll Forever Foundation (RRFF), is still accepting registrations as it continues through December 16. Stevie Van Zandt’s Rock and Roll Forever Foundation is a 501(c)(3) organization that integrates arts throughout K-12 classrooms via rich, standard-aligned lesson plans and hands-on teacher workshops, all delivered to educators and districts at no cost. TeachRock is a standards-aligned arts integration curriculum that uses the history and culture of popular music to engage students in all disciplines. From social studies and language arts to geography, STEAM, general music, and more: TeachRock has engaging and meaningful material for every K-12 classroom, and it’s all shared with teachers and students at no cost. TeachRock is endorsed by the National Council for the Social Studies, the National Association for Music Education, and the National Council for Geographic Education, with partners including Scholastic Inc., PBS, Reelin’ in the Years, ABC News, Rock’s Backpages, New York University’s Steinhardt School, and the Grammy Museum. For lesson plans and additional information, please visit teachrock.org. More than 8 million tons of plastic pollution enter the world’s oceans each year, harming animals and ecosystems. Toxic chemicals in plastic can leach from food containers and are linked to human health problems such as cancer, infertility, and obesity. Posts on Marriott Hotel’s social media channels show customers complaining about the plastic containers for room service since 2016. A Tweet from Van Zandt calling out Marriott on Sunday was liked 1.4K times. 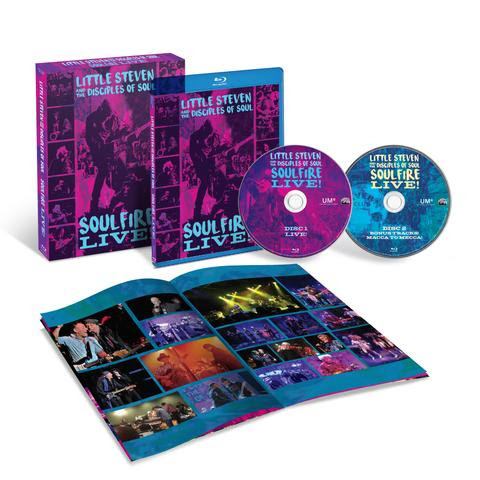 The vinyl box set and Blu-ray editions of SOULFIRE LIVE! also includes all of the material from the 3CD version released last year. Among the many highlights aresignature songs from his illustrious solo career – including “Lying In A Bed Of Fire,” “Bitter Fruit” and “Out Of The Darkness,” as well as classics written for Southside Johnny and the Asbury Jukes, including “I Don’t Want To Go Home” and “Love On The Wrong Side Of Town” – alongside electrifying takes on a number of Little Steven’s all-time favorite rock ‘n’ roll songs, including Tom Petty and the Heartbreakers’ “Even The Losers,” AC/DC’s “You Shook Me All Night Long,” John Lennon’s “Working Class Hero,” The Allman Brothers Band’s “It’s Not My Cross To Bear,” The Animals’ “We Gotta Get Out Of This Place,” and The Ramones’ “Merry Christmas (I Don’t Want To Fight Tonight).” Also included are spirited renditions of The Electric Flag’s “Groovin’ Is Easy,” Etta James’ “Blues Is My Business,” and James Brown’s “Down And Out In New York City,” from his SOULFIRE album. Van Zandt’s inimitable introductions detail each song’s unique history and singular spot in his life and remarkable career. SOULFIRE LIVE! showcases special guest appearances from some of Little Steven’s closest friends, collaborators, and favorite artists. Among the highlights are versions of Moby Grape’s “Can’t Be So Bad” performed with the legendary San Francisco band’s founding member, Jerry Miller; the Motown classic, “Can I Get A Witness,” performed with New Jersey’s own Richie Sambora; The J. Geils Band’s “Freeze Frame” with vocals from the one and only Peter Wolf; and “Tenth Avenue Freeze-Out” and Little Steven’s own “I Don’t Want To Go Home,” both joined by Bruce Springsteen. The SOULFIRE LIVE! Blu-ray video edition includes Little Steven and the Disciples complete Cavern Club concert alongside video performances of each song on the 3CD/vinyl set, exclusive interviews, and behind-the-scenes footage. In addition, the Blu-ray features a special documentary about the Cavern Club performance that saw Little Steven honored with a brick in the club’s hallowed Wall of Fame before leading his band through swift rehearsals of Beatles songs mere minutes ahead of their performance. Whichever version you pick up, SOULFIRE LIVE! is an epic and electrifying journey through rock ‘n’ roll history led by one of its most passionate practitioners, showcasing Steven Van Zandt’s limitless knowledge, talent, and sheer love for the genre in all its many shapes and guises. Little Steven and the Disciples of Soul have announced the release of their eagerly awaited new album. SUMMER OF SORCERY, the legendary rock ‘n’ rollers first album of new material, arrives May 3 via Wicked Cool/UMe. SUMMER OF SORCERY is available for pre-order now. The album will be released on CD, digitally and on vinyl as double LP on 180-gram black vinyl. A limited edition version will be available as a double LP on 180-gram psychedelic swirl vinyl exclusively via uDiscover. All digital pre-orders will be joined by an instant grat download of the LP’s jet-fueled first track release, “Superfly Terraplane,” which premiered today via Rolling Stone. Little Steven is joined on this thrilling musical journey with his all-star band the Disciples of Soul, a 14-strong ensemble made up of some of the best studio and live musicians in the business. Leading the charge alongside Van Zandt is musical director and guitarist Marc Ribler (Darlene Love, Roger McGuinn, Carole King) who conducts the band consisting of Lowell “Banana” Levinger of The Youngbloods on piano and Wurlitzer, bassist Jack Daley (Lenny Kravitz, Boz Scaggs, Darryl Hall), drummer Rich Mercurio (Ben E King, Sara Bareilles, Idina Menzel), percussionist Anthony Almonte (King Creole and The Coconuts), Andy Burton on B3 organ, piano, synthesizers (Cyndi Lauper, John Mayer, Ian Hunter), the dynamite horn section of horn director Eddie Manion on baritone saxophone (Diana Ross, Bruce Springsteen, Southside Johnny), Stan Harrison on tenor saxophone and flute (David Bowie, Mick Jagger, Duran Duran), Ron Tooley on trumpet (James Brown, John Lennon, Maceo Parker), Ravi Best on trumpet (Aretha Franklin, Stevie, Wonder, Kool and The Gang) and Clark Gayton on trombone (Sting, Bruce Springsteen, Joss Stone, Rhianna). The band is rounded out with the soulful, synchronized dancing backup singers Jessie Wagner (Kid Rock, Lenny Kravitz, Chic ), Sara Devine (Alicia Keys, Mary J Blige) and Tania Jones (Disciples of Soul). Little Steven and the Disciples of Soul will celebrate SUMMER OF SORCERY with special record release shows at The Saban in Los Angeles on May 4 and at the Paramount Theatre in Asbury Park, N.J. on May 8th. A wide-ranging world tour will follow, beginning May 16 at Liverpool, UK’s 02 Academy and then making headline stops across the United Kingdom, Germany, Denmark, Sweden, Norway, Belgium, the Netherlands, Switzerland, Italy and Spain. Exclusive VIP Meet & Greet Upgrade Packages are available for most dates. The “SUMMER OF SORCERY TOUR” will hit North America this summer – a full itinerary will be announced soon. In addition, Little Steven will lead the Disciples of Soul down under for the very final dates on his epic “SOULFIRE TOUR,” including a pair of hugely anticipated performances at the 30th anniversary Byron Bay Bluesfest in Byron Bay, Australia (April 18 and 20). For complete details, updates, and ticket availability, please visit www.littlesteven.com/on-tour. Van Zandt’s first solo album as Little Steven in close to two decades, 2017’s SOULFIRE saw the Rock & Roll Hall of Famer revisiting songs that spanned the length of his career as artist, performer, producer, arranger, and songwriter, focusing on the “soul horns-meet-rock ‘n’ roll guitars” sound he first pioneered on Southside Johnny and the Asbury Jukes’ classic first three albums and later, his own first solo LP. The album saw Van Zandt uniting an all-new Disciples of Soul, complete with three backing vocalists and a full horn section featuring original Asbury Jukes/Miami Horns saxophonists Stan Harrison (tenor) and Eddie Manion (baritone). Little Steven and his 15-piece big band spent nearly two years traveling the world on the SOULFIRE Tour, not to mention last year’s “SOULFIRE TEACHER SOLIDARITY TOUR” supporting TeachRock, the Rock and Roll Forever Foundation’s national initiative to bring music curriculum into schools across the country. Still, the planetary success of the SOULFIRE project left Van Zandt to ponder: Where do I want to go now? Recorded last year mid-SOULFIRE Tour and then mixed whilst on the road once again, SUMMER OF SORCERYrepresents a straightforward progression from its predecessor, the first time in Van Zandt’s long career that he’s maintained a band line-up and sonic approach from one solo work to the next. Musician, band leader, producer, actor, arranger, activist, and so much more, Little Steven Van Zandt is known and beloved around the world for his utterly distinctive songwriting, artistic ambition, and unyielding belief in the power and glory of classic rock ‘n’ soul. In addition to his ongoing role as a touring and recording member of The E Street Band, the past two decades have seen the Rock and Roll Hall of Famer expand his personal parameters to include legendary work as an actor on The Sopranos and Lilyhammer as well as host-creator of Sirius XM’s one-and-only “Little Steven’s Underground Garage” (not to mention creator of Sirius XM’s long-running “Outlaw Country” format). Van Zandt’s myriad creative efforts in recent years include composing the score for all three seasons of Lilyhammer along with landmark work as producer and songwriter, lending his distinctive craft to records including Darlene Love’s acclaimed 2015 release, INTRODUCING DARLENE LOVE. Van Zandt’s first solo album in close to two decades, SOULFIRE drew rapturous applause from fans and critics alike upon its 2017 release, with Rolling Stone declaring, “Rock’s ultimate sideman reclaims the Jersey Shore sound he helped invent.” “Cynicism, irony and cultivated hip detachment have taken their toll on rock ‘n’ roll,” raved USA Today. “With SOULFIRE, Van Zandt aims to blow all that out and lead listeners back to its more passionate essence.” “It’s hard to imagine a more joyous and revelatory contemporary blue-eyed soul recording,” enthused American Songwriter. “The appropriately titled SOULFIRE is a tough, tight and clearly inspired project as well as a most welcome return from the musical shadows for Steven Van Zandt.” SOULFIRE “hearkens back to Van Zandt’s classic first solo album of gritty, greasy, horn-accented ’60s-style rock and soul,” noted Billboard, while Paste proclaimed, “Rockier than Motown or the Sound of Philadelphia, this a joyous invitation to live and love. Little Steven and the Disciples of Soul have just touched down in Australia for a run of shows that will kick off this Saturday, April 13 in Perth. The 15-piece band will perform a pair of hugely anticipated performances at the 30th anniversary Byron Bay Bluesfest in Byron Bay (April 18 and 20). They will wrap the tour in Auckland, New Zealand on April 27. The band will then head home to the U.S. to celebrate Summer Of Sorcery with special record release shows at The Saban in Los Angeles on May 4 and at the Paramount Theatre in Asbury Park, N.J. on May 8. A wide-ranging world tour will follow, beginning May 16 at Liverpool, UK’s 02 Academy and then making headline stops across the United Kingdom, Germany, Denmark, Sweden, Norway, Belgium, the Netherlands, Switzerland, Italy and Spain.